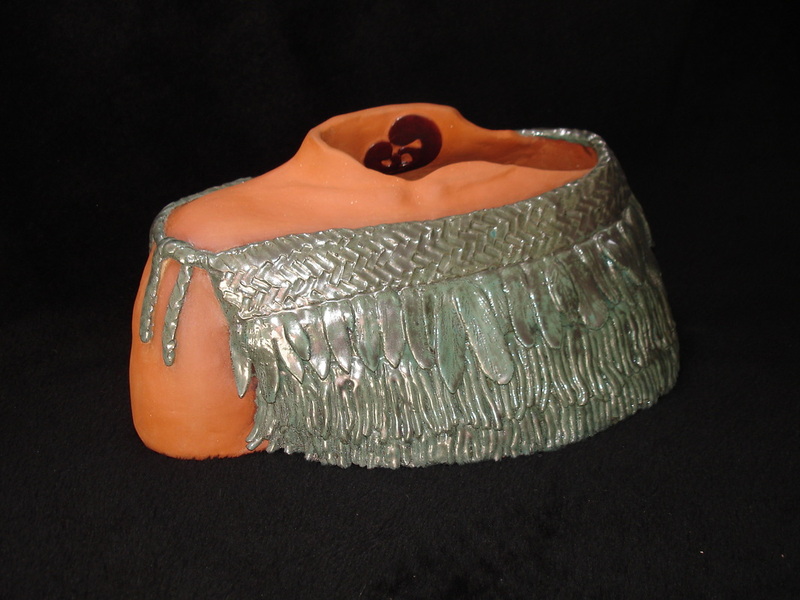 This piece was made in earthenware and shows a female shoulder wearing a Maori ceremonial feather cape. The feathers were individually made and applied to the form then additional texture was added to both the cape and the shoulder band. After firing the cape was sealed, painted with acrylics and lacquered. The body form has no additional finished and is bare clay. This time paint was used because I felt too much detail might be lost by glazing. But nothing stays the same and this piece is no exception. An opportunity came to enter the piece as an exhibit in an outdoor area and she was forced to go through metamorphosis by fire. The paint was burned off and a new coat of glaze was added. It is always hard to judge.... better or just different? Whichever the answer she will now wear the glaze for the rest of her life because, while paint is perishable, glaze, like diamonds, is forever! !